IRVINE, Calif.--(BUSINESS WIRE)--TRI Pointe Group has received the Builder of the Year Award by BUILDER Magazine, the trusted source and leading brand for the residential construction industry. The Builder of the Year Award is BUILDER’s highest yearly honor. TRI Pointe Group was honored last night for its excellence in successful business strategy, its numerous achievements and its respected corporate leadership during the annual awards program at BUILDER’s Housing Leadership Summit in Aventura, Florida. TRI Pointe was also named the fastest growing homebuilder in the country by BUILDER, with the most year-over-year growth in home deliveries of any other homebuilding company. Originally founded as TRI Pointe Homes in 2009 by building veterans Doug Bauer, Tom Mitchell and Mike Grubbs, during one of the building industry’s worst recessions, the company went public in 2013. As growth continued and new markets were added, the company purchased Weyerhaeuser’s homebuilding subsidiary, Weyerhaeuser Real Estate Company (“WRECO”), in 2014. Four short months after closing the merger, the company announced TRI Pointe Solutions, a suite of homebuyer services that provides end-to-end support throughout the closing process. The suite is made up of “TRI Pointe Connect,” formed as a joint venture with imortgage, which provides mortgage related services, and “TRI Pointe Assurance,” a wholly owned TRI Pointe company, which acts as a title agency for First American Title Insurance Company. Since its inception, the company has built communities that deliver innovative single-family homes and townhomes. TRI Pointe Group continues to design, construct and sell premium homes through its portfolio of six quality brands across eight states, which includes Maracay Homes in Arizona; Pardee Homes in California and Nevada; Quadrant Homes in Washington; Trendmaker Homes in Texas; TRI Pointe Homes in California and Colorado; and Winchester Homes in Maryland and Virginia. “TRI Pointe Group is proud and humbled to accept this prestigious honor from a well-respected publication such as BUILDER,” said Doug Bauer, CEO of TRI Pointe. “We could not have accomplished this milestone without the talented team at TRI Pointe Group. Our people are our greatest asset, and without the strong and experienced leadership teams at our six brands none of this could have been accomplished. Our team members are passionate about making a difference in our customer’s lives every day. This passion is what fuels the future of these great homebuilding brands. From its beginnings as a regional builder in 2009 that survived the recession, and to its current status as a national builder in just over five years, TRI Pointe Group has positioned itself for strong growth in the coming years. Headquartered in Irvine, Calif., TRI Pointe (NYSE: TPH) is one of the top 10 largest public homebuilders by equity market capitalization in the United States. The company designs, constructs and sells innovative single-family homes and townhomes through its portfolio of six quality brands, which include Maracay Homes of Arizona; Pardee Homes of California and Nevada; Quadrant Homes of Washington; Trendmaker Homes of Texas; TRI Pointe Homes of California and Colorado; and Winchester Homes of Washington DC and Virginia. TRI Pointe Group was honored to receive the 2015 Builder of the Year Award by BUILDER magazine and was named the fastest-growing public homebuilder in the country. 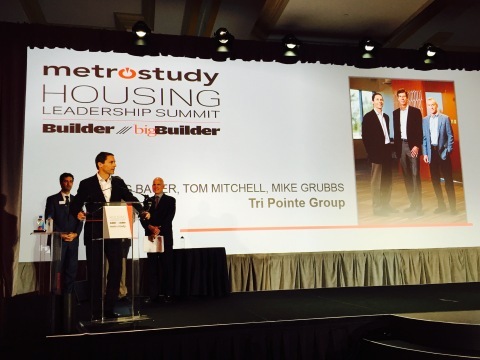 In 2014 TRI Pointe Group was awarded Developer of the Year by Builder & Developer magazine. Additional information is available at www.tripointegroup.com. Published by Hanley Wood, BUILDER is the authority in the residential construction industry and serves as the magazine of the National Association of Home Builders (NAHB). For more than three decades, BUILDER has provided essential news, information and resources about products, technologies, trends, regulatory requirements and best practices to help home building professionals build smart.